Engineers at NovaCopy Inc. never thought saving the life of a disabled duck would be a project they would encounter when working in the 3D printing industry. However this week, Joel Graves, a 3D printing engineer at NovaCopy had to produce the prototype for a mold which would be used as a prosthetic foot for a duck named Buttercup. Last year, a duck named Buttercup was born in a high school biology lab with a backwards left foot. When his second owner, Mike Garey, of Feathered Angels Waterfowl Sanctuary adopted Buttercup, Garey knew Buttercup woulnd't be able to survive in his condition. "When he would walk outside, his leg would start bleeding," he said. "I knew Buttercup would be better off as a peg-leg duck than a duck with a disabled foot." A local veterinarian amputated the duck's left foot in February and the long healing process began. While buttercup's foot was healing, Garey started looking for options in creasing a prosthetic foot for Buttercup. In the end, he turned to 3D printing as it will allow the exact model for a mold to be built with extreme precision. Melissa Ragsdale, president of 3D printing solutions for NovaCopy Inc. agreed to donate a 3D printed duck foot that coulld be used as a model for Buttercup's new prosthetic foot. 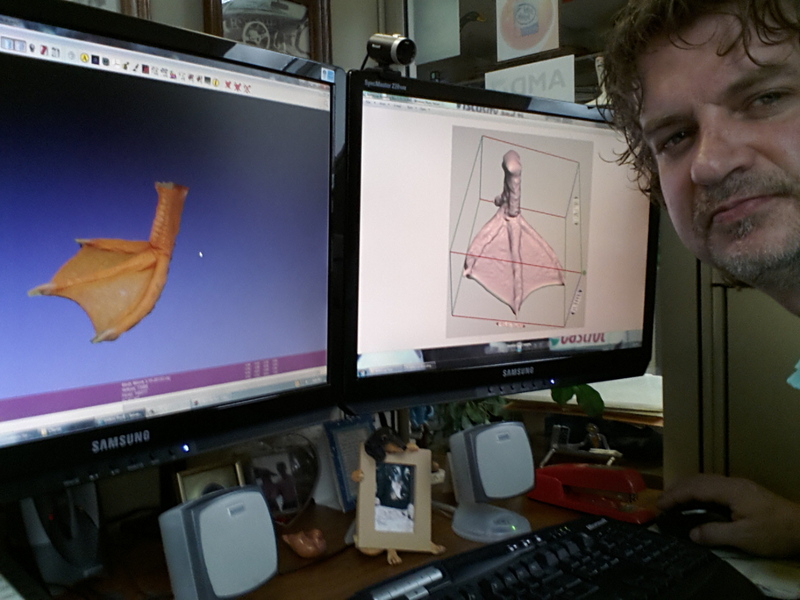 Garey wanted Buttercup's prosthetic to be as authentic as possible, so he used Buttercup's sister as a foot model and created a digital copy in an Autodesk program based on Buttercup's sister's foot; and then began the 3D printing process which took just over 13 hours. Buttercup will be trying his new prosthetics in the coming months. If you would like to keep track of his progress, you can check out Feathered Angel's Facebook page for updates!